Ever since the Voyager 2 data confirmed the nonsymmetrical shape of the solar system scientists have pondered its cause (i). 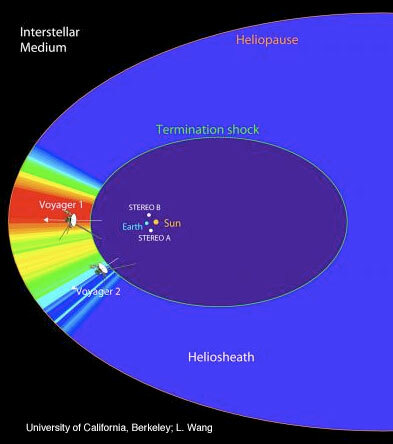 In summary, the edge of the heliosphere (the place where the solar wind slows to sub sonic speeds) appears to be 1.2 billion kilometers shorter on the south side of the solar system (and in the general direction of the winter solstice, the direction of Voyager 2), than it is on the edge of the planetary plane (where Voyager 1 exited approximately a year earlier). This indicates the heliosphere is not a sphere at all but a bullet shape. More data is required to determine the exact shape in all directions. The initial explanation was there must be some sort of gas cloud pressing against one side of our solar system. While this hypothesis is plausible there is another possibility that deserves consideration; stellar wind. The sun’s solar winds are primarily driven by its magnetic field. When magnetic storms arise on the sun it produces coronal mass ejections (CME’s), which are like waves or ripples on the solar wind. The solar wind is constantly pushing on the daylight side of the earth’s magnetosphere squashing it in a pattern similar to the way the sun’s magnetic field seems to be squashed where Voyager 2 exited the solar system. Thus it is possible that the dented solar system might be due to the same type of cause; stellar winds from a not too distant star. Some indication of this might reside in the data recently received by NASA’s sun-focused STEREO spacecraft. The twin STEREO spacecraft were launched in 2006 into earth’s orbit about the sun to obtain stereo pictures of the sun’s surface and to measure magnetic fields and ion fluxes associated with solar explosions. Between June and October 2007, the STEREO spacecraft detected atoms “originating from the same spot in the sky: the shock front and the heliosheath beyond, where the sun plunges through the interstellar medium”, and found “energetic neutral particles from beyond the heliosphere” that are moving toward the sun (ii). While this might be due to other causes such as “charge exchange between hot ions and neutral atoms” as hypothesized by scientists at UC Berkeley, it may also indicate the source of the asymmetrical solar system is due to the stellar wind from another star rather than an interstellar gas cloud. More data is needed and should be forthcoming with the pending launch of the Interstellar Boundary Explorer (IBEX), due to begin receiving data some time in the next year. Then do all three of these directions coincide? Has the IBEX data been published?